Earn $30.59 in Rewards credit (3059 points) What's This? 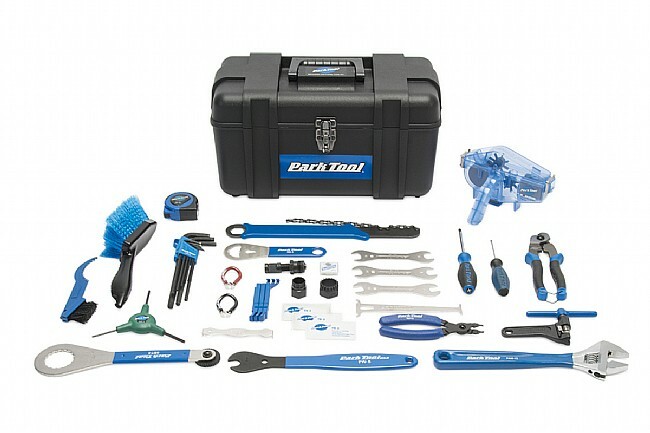 The AK-3 Advanced Mechanic Tool Kit from Park Tool is a comprehensive collection of 40 high-quality tools that can tackle a variety of modern bike models such as a Torx 3-way wrench, compact crank puller, and so much more. This collection of tools is housed in a heavy-duty toolbox for organized storage. TWS-3 Torx® Compatible 3-Way Wrench. BBT-9 Bottom Bracket Tool for 16-Notch External Bearing Cups. BBT-32 Bottom Bracket Tool for 20-Notch Shimano® and ISIS® Drive. CN-10 Professional Cable and Housing Cutter. DCW-1 Double Ended Cone Wrench: 13/14mm. DCW-2 Double Ended Cone Wrench: 15/16mm. DCW-3 Double Ended Cone Wrench: 17/18mm. #349 Soft Bristle Soaping Brush. HXS-1.2 Professional L-Shaped Hex Wrench Set. PW-5 Home Mechanic Pedal Wrench. SD-3 3mm Flat Blade Screwdriver. SR-12 Chain Whip 5- to 12-Speed Compatible. SW-0 Precision Spoke Wrench: .127". SW-2 Precision Spoke Wrench: .136".